Musei Vaticani – I (Chris) had in Rome an opportunity of a private guided tour of the Vatican Museums, including the Sistine Chapel. The tour was about 1 hour long and began at dusk after all the regular visitors had left. These are painted on the spaces at the top of columns. Notice the 3D effect created by the vividly colorful foreground and faded monochromatic background. The main attractions of the museum are not only the classical and Renaissance objects placed within it but also the artwork on the walls and ceilings. The painting above was done in the corner of a room. The Gallery of Maps (Galleria delle carte geografiche) is one of my all-time favorites – it is so cool to have all the beautiful and detailed maps in one place. The Gallery of Maps contains a series of painted topographical maps of Italy based on drawings by friar and geographer Ignazio Danti. The gallery was commissioned in 1580 by Pope Gregory XIII and took Danti three years (1580–1583) to complete the 40 panels of the 120 m long gallery. The highlight of the tour is the Sistine Chapel, the last of the 54 halls, the Musei being one of the largest in the world. The papal chapel was built within the Vatican between 1477 and 1480 by Pope Sixtus IV, for whom the chapel is named. This is where the Papal Conclave takes place to elect a new pope. I was initially told by the guide that photography is prohibited inside the Chapel but an official later indicated that during our visit, it is permissible as long as the flash is not used. Hurrah. I can share ! The frescoes of the Sistine Chapel were restored between June 1980 and December 1999, instead of appearing monochromatic due to candle smoke, it is now bright and almost spring-like. The Sistine Chapel ceiling was painted by Michelangelo (Michelangelo di Lodovico Buonarroti Simoni, I have never known his full name until just now) between 1508 and 1512. Along the central section of the ceiling, Michelangelo depicted nine scenes from the Book of Genesis, the first book of the Bible. One of the most widely recognized images in the history of painting, Michelangelo shows God reaching out to touch Adam. Below, appearing at the far end of the Chapel, is the next most famous painting by Michelangelo – the Last Judgement – a depiction of the Second Coming of Christ and the final and eternal judgment by God of all humanity. This is, in the eyes of Renaissance catholics, how it all began and how it will end. Fascinating. We arrived at Madrid in mid-afternoon and missed lunch. So we settled for a snack at this hotel situated in the same plaza as our apartment. This was in June 2016. The eatery is located in the ME Madrid Hotel Reina Victoria situated in the west end of Plaza Santa Ana. There are several different areas – upon entry there is a bar. The eatery’s front door faces the plaza in the heart of the Literary Quarter (Barrio de las Letras). There is a restaurant at the back that looked decent. We sat in an area where they served us snacks. It was really relaxing as we can watch the activities in the plaza, while sitting in the shade under a ceiling fan with a cold drink. It was sunny and quite hot outside. Our snacks were standards with a slight twist and they were tasty. Do not remember seeing tapas/pintxos on the menu – may be because the real kitchen is closed. We had quite a few of these dishes as we were hungry. As it got later at night, there was a velvet rope scene outside for the roof top bar next door. But this place was packed. There was a DJ spinning, facing the plaza, so it was very lively in the evening – almost too noisy for we had an apartment facing the plaza. Plaza Santa Ana reminded us of Washington Square Park in NYC. Definitely worth stopping by for a drink, especially in the evening. El Caldero is situated in a central, pedestrian-only touristy area of Madrid. It was only one block from Plaza de Santa Ana where we were staying. It was founded in 1973 and specializes in Spanish rice dishes – paella. Their signature dish is rice cooked in a cauldron (more like a bucket) as illustrated by this painting – which is much deeper than the pan typically used in cooking paella. We ordered the paella and the “bucket” of seafood-flavored rice. The waiters distributed the food on our plates – so we did not have to scoop the rice out of the bucket. We came here towards the end of our trip and at that time during the trip, we have not even touched rice once, having been focusing our attention on tapas/pintxos. According to their website (click here), which is quite colorful, they follow the cooking traditions of Murcia – which might explain the sauces, not sure if this is true. They claim to combine the ingredients from the Mediterranean and the Spanish interior to make the dishes – Murcia as a province, has a coast and a vast interior land mass. Dessert drinks on the house ! We enjoyed our meal there. Recommendable. After all that Russian art that came before this post, we thought a post about a hearty meal is apt. El Asador de Aranda is a chain of steakhouse in Spain that are well-known for their suckling lamb roasted in clay oven. We went to the one in downtown Madrid on Calle de Preciados. Given its central location, it is a bit touristy but we were hungry and a bit intrigued by its appearance. We suspect the restaurant wants to replicate the ambiance of a castle and therefore surrounded the entire dinning space with heavy wooden panels – the kind one expect to see in a church or a court of law. The almost-medieval decor gives the impression that the restaurant takes its food seriously, the old-fashioned way. We trusted their statement despite its touristy location. They claim to have over 50 years of experience in slow-roasting suckling lamb – their slogan is “el cordero como ya nadie lo cocina” (lamb like nobody cooks it anymore). We ordered the touristy basics – started with sangria and gazpacho. The steak was good. Probably because they showered it with salt flakes just before serving. We order their specialty – a leg of lamb – which they show you and then cut up into pieces. It was certainly very tender, but the steak was better if you ask me. Here is the clay wood-burning oven and somebody’s order of steaks and half a lamb. We are so used to going to the supermarket instead of the butcher – it is a bit startling to see a whole animal on a plate. Reliable and recommendable. The chain’s website is here. They have quite a few restaurants around the country, three in Madrid, three in Barcelona, and three in Aranda de Duero (a small town just north of Madrid) where they started. In the last few posts, I have been putting up photos of Russian modern art that are on display in the Tretyakov Gallery on Krymsky Val (Третьяковская галерея на Крымском Валу) – a branch of the State Tretyakov Gallery. This is part 5, the last one – various sculptural pieces scattered around the gallery. Don’t miss part 1, part 2, part 3, and part 4. This is quite an iconic piece, I liked it – it somehow made me think of a Star Wars movie poster – even the postures are not the same. There are several that are very dynamic. A few pieces invite the viewer to complete the scene mentally – clever and effective. Quite a few pieces used wood as the medium (see the cat and the dog above). This post concludes my whirlwind tour of a great museum/gallery. Several posts ago, I put up photos of Russian modern art that are on display in the Tretyakov Gallery on Krymsky Val (Третьяковская галерея на Крымском Валу) – a branch of the State Tretyakov Gallery. I have a couple more posts on this visit – this is part 4, and part one is here, part 2 here and part 3 here. I hope you enjoyed the posts so far, like the crowd in the painting below. Rather than showing the art work chronologically, I pulled these pieces together because they appear to have an overall darker theme. Some are more abstract than others. Some reflects societal issues ? IT and I visited the Vitra Design Museum at Weil am Rhein in April 2016. It is a beautiful, well-designed (duh), starchitect-built campus – more about this place in future posts. From 26.02 – 29.05.2016, in a free-standing gallery next to the museum, the exhibition titled “Objection! Protest by Design” was held. The exhibition presented a number of objects that was spawned by the pro-democracy Umbrella Movement 雨傘運動 in Hong Kong that took place between 26 September 2014 and 15 December 2014. Much of what I wrote below came from the Vitra-distributed exhibition guide. In a reaction to proposed changes in the electoral process in Hong Kong, spontaneous student protests erupted in Hong Kong. The protesters created numerous informal and improvised physical structures, graphic images, digital art, and online networks; protesters used the umbrella that gave the movement its name to protect themselves from the police. “Broken” by Jonathan Mak. Notice the fractured leg and an off-balance star and the tiny umbrella beneath it. 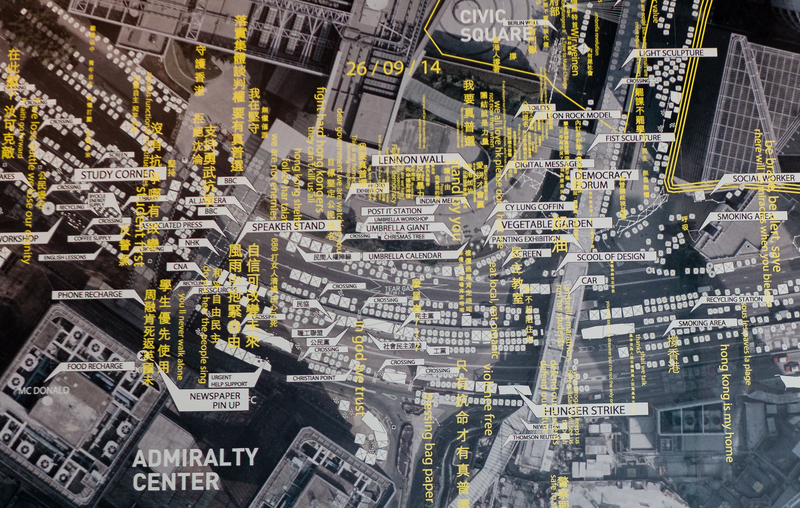 There were two large “tables” which were overlaid with a large scale birds-eye view of the streets in Hong Kong. Protesters were highly organized in their occupation of three main heavily trafficked protest sites: Admiralty, Mong Kok and Causeway Bay. Do click on the map below here to see in details the Admiralty site. A large number of installations (barricades, means to cross the expressway median), first aid stations, study areas, press stands and camp sites appeared in the 8-lane expressway and two shopping districts to become voices and means of protests. The appearance of these installations were recorded and mapped, and shown on these two tables. A number of barricades were set up to create a safety zone in order to make a defined space for resting. They were recreated here by 3D printing. The Lennon Wall was created by students and social workers with Post-Its on a wall of a stair leading from a street up to a pedestrian footbridge in Admiralty. They invited people to write down their hopes and reasons for staying in Admiralty after the police tried to disperse the protestors with tear gas. At the end of the occupation, the Wall was taken down and parts of it were preserved. The exhibition wanted to show how design not only shapes and define products, but can also function as an agent of change in politics, communications and social innovations. I hope the people of Hong Kong all voted and voted wisely today. In these few posts, I am putting up photos of Russian art on display in the Tretyakov Gallery on Krymsky Val (Третьяковская галерея на Крымском Валу) – a branch of the State Tretyakov Gallery. Click to see Part 1 and Part 2. This section includes art from the period after the 1920’s. According to the museum guide, this generation of artist was brought up on the avant garde but they created a figurative and conventionally expressive style. According to the museum guide, paintings depicted industrial labor, technology and sports channeling the notion of an utopia where man create the world by his force. The modern woman, strong, free and liberated was a prominent theme in the art of the 1930’s.